Bangalore: Infosys Ltd, India’s second largest information technology (IT) services company, posted healthy revenue growth and margins for the September quarter, besides maintaining its volume growth projections for the year amid macroeconomic uncertainty, pushing the stock higher and cheering the forward march of shares of other IT companies. 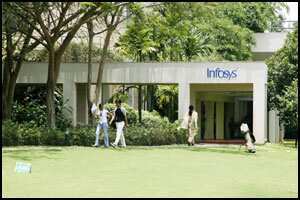 Infosys shares rose 6.83% to ₹ 2,680.50 each, while the benchmark Sensex rose 2.55% to 16,958.39 points. Other IT stocks rallied as well, with the sectoral index rising 5.21% to 5,518.11. The company witnessed “balanced growth all around" with 45 new client additions, said chief executive officer S.D. Shibulal, with 17 of them in what he characterized as “investment areas" for Infosys— segments such as healthcare. This is relevant, given the company’s stated focus on growth areas other than financial services, which still constitutes about 36% of its revenue. The dollar growth revision was only because of currency movement, and volume growth projections and pricing assumptions were unchanged, said chief financial officer V. Balakrishnan. That would suggest that Infosys doesn’t think recent global macroeconomic developments have resulted in a deterioration of the business environment. “This year is abnormal in that client spending will be evenly spread out across the four quarters, rather than the first and second quarter getting front-loaded, with softer quarters following," he said. Seven of the new clients added were Fortune 500 firms, Shibulal said. He also cited three wins in large “business transformation" projects—in manufacturing, retail and engineering innovation. One customer had grown to become a $300 million (Rs 1,480 crore today) client, he said. Products and platforms, another area of focus for the company and which currently contributes under 8% of revenue, has also grown, with 20 clients added, among the largest such in this space for Infosys, Shibulal said. The total contract value in the platform space has touched $200 million in revenue, he added. Growth in financial services was evenly distributed, with 17 new clients for banking product Finacle alone, said Ashok Vemuri, who heads the financial services business and heads North America as well. “There were no project cancellations or reductions in budgets," he said. Revenue rose a little higher than generally expected by analysts to ₹ 8,099 crore in the September quarter, up 8.2% sequentially, with profit rising to ₹ 1,906 crore from ₹ 1,720 crore. Profit in the June quarter was hit by wages and taxes. Margins improved in the September quarter by 1.9 percentage points to 28.16%. Infosys’ own guidance for the September quarter had put revenue at ₹ 7,699-7,810 crore. The company has also increased its full-year EPS guidance to ₹ 143.02-145.26 from ₹ 128.20-130.08. “Sentiment-wise, they have done a really good job," said Abhishek Shindadkar, analyst at ICICI Securities Ltd. “The dollar guidance cut was already factored in by the markets, and the strong upward revision in EPS was much more than expected." The management, however, flagged the global macroeconomic environment as uncertain and a cause for concern. “Pricing is stable, and there is no downward pressure, but given the environment, getting price increases can be difficult," Balakrishnan said. September quarter EPS rose to ₹ 33.30 from ₹ 30.14 sequentially. Infosys had guided EPS for the quarter at ₹ 29.64-30.08. The company sees rupee revenue for FY12 at ₹ 33,501-34,088 crore, against the ₹ 31,777-32,311 crore projected earlier. “The increase in the INR (Indian rupee) guidance for FY12 is largely driven by currency," said Dipesh Shah, head (fundamental research) at Kotak Securities Ltd. “The volume growth has been maintained in the backdrop of a challenging macro scene." For the December quarter, Infosys expects revenue at ₹ 8,826-9,012 crore and EPS at ₹ 38.51-39.20. Last year’s September quarter was a record one for Infosys, with revenue growing by more than $100 million and sequential growth at 12% in revenue. There was an element of euphoria at the time, with a sense that the economic slump was a thing of the past. The persisting macroeconomic pressures have proven a dampener, but companies seem better prepared this time, the management said. Infosys declared an interim dividend of ₹ 15 per share. On the question of acquisitions, Shibulal refused to say that the company was any closer than before, but declared that “the intention" was there, and there was a focus on the products and platforms space for an acquisition. On the domestic market for Infosys, Balakrishnan said the project for processing tax returns was being ramped up, from 8.5 million returns processed so far to 15-20 million. The company was also participating in bids by India Post and other government entities, he added.